Slipping through Pole Pass on the way to Deer Harbor from Double Island in a sea kayak or an inflatable dinghy with a small outboard is easy, but it requires planning. The tight bottleneck channel can become a virtual boat parade route in the summer. The safest approach is to proceed single file, taking turns and watching for the wakes of larger boats. 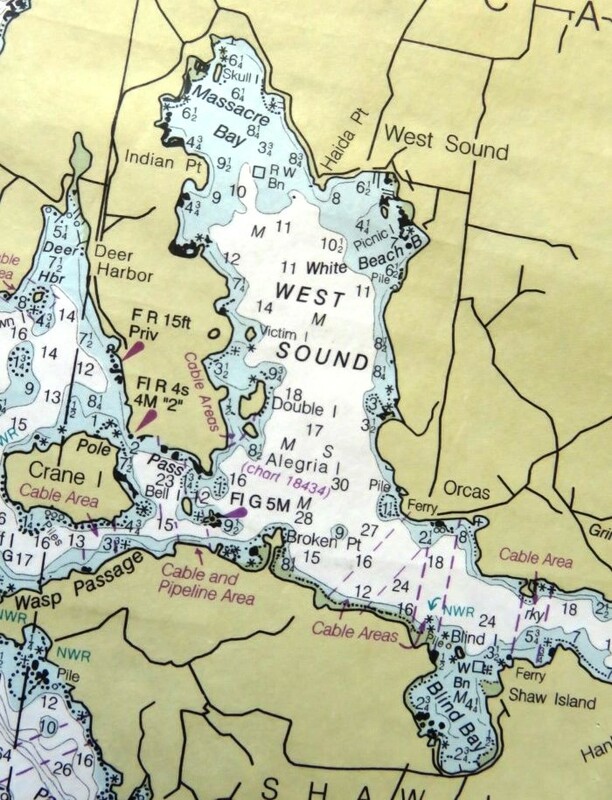 Use a nautical chart and pay close attention to the direction and strength of the current–especially during spring tides when it can race up to two knots and create occasional standing waves. Even larger vessels avoid these and wait for calmer water. 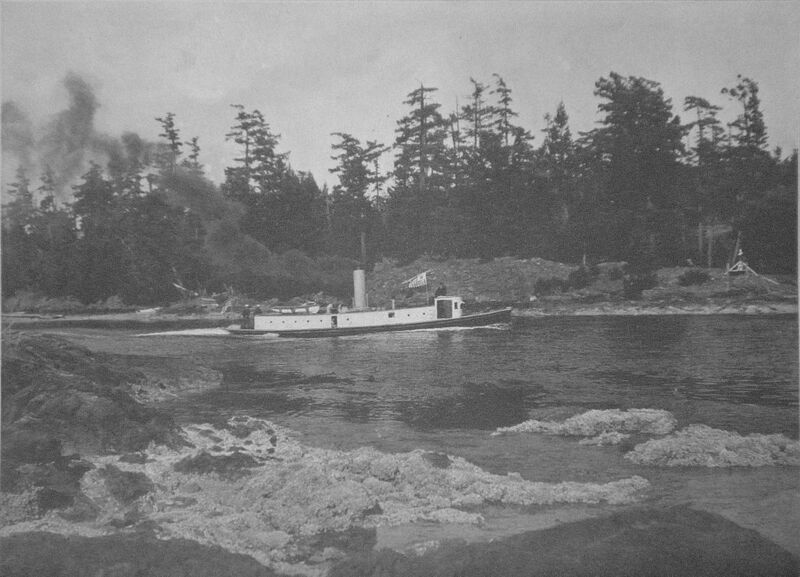 Approximately 75 yards wide, Pole Pass received its name because Native Americans used to string a net made of kelp and cedar bark between a pole and a tree on opposite sides of the channel to catch flying sea birds. 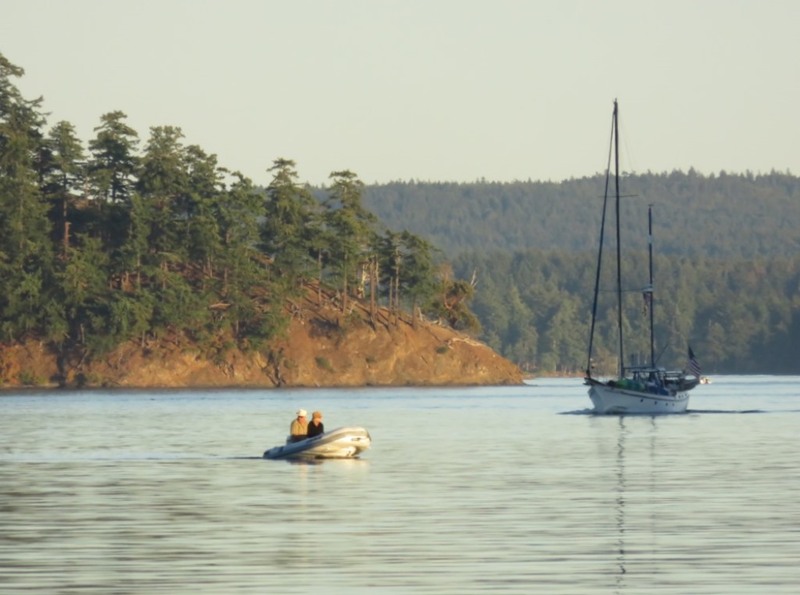 Today, skippers use it as a shortcut to reach destinations in the northwestern San Juan Islands, avoiding other boaters and the Washington State ferries negotiating twists and turns in busy Wasp Passage. 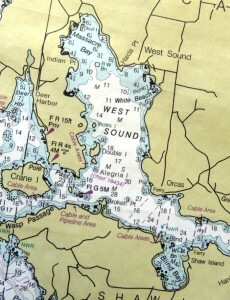 Of course, if there is a fast current in Pole Pass, Wasp Passage becomes the preferred route. 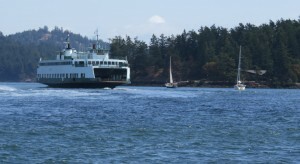 Although we sail as if we’ll meet a ferry at any time in the San Juan Islands, this is one place where we’ll check the Washington State Ferry’s schedule to know when we’ll meet them. Another lesson we’ve learned in our 35+ years of boating is to add extra time to our planned schedules, so that we don’t put ourselves in dangerous situations due to inclement weather or other unforeseen circumstances. 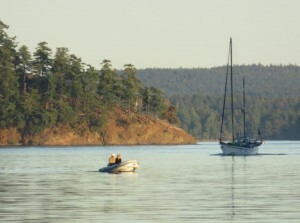 Deer Harbor, named by four Englishmen (Louis Cayou, Jim Bradshaw, William Moore and Ed Guardon) on an autumn deer hunting expedition for the Hudson Bay Company in 1853, is a family-friendly vacation spot on Orcas Island. 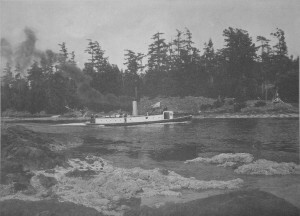 Many visitors arriving by boat or car stay at the historic Deer Harbor Inn built in 1915 with its variety of accommodations, pool, and well-liked restaurant. Others prefer fancy bed & breakfasts and some rent private cabins or homes nestled in the surrounding pastoral setting. It’s a great place for holding weddings, family reunions, and boat rendezvouses. At the marina, the small Market Dock Store sells groceries and grills breakfast sandwiches and hamburgers for hungry adventurers. On the float next to the ramp, The Barge gift shop stocks sweatshirts, books, toys, and fishing gear. A wide variety of boat rentals are offered, from kayaks to fully-skippered charter boats to whale watch tours. 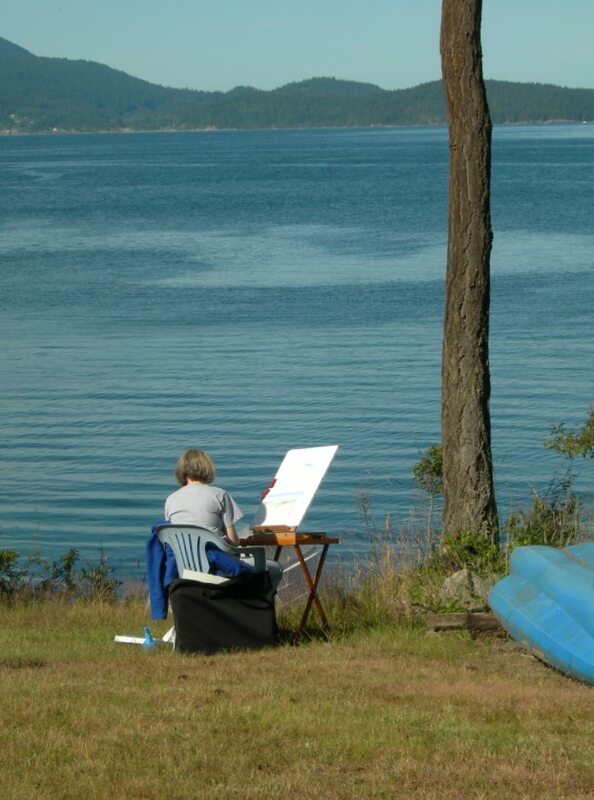 One of my fondest memories is taking a charter boat from Deer Harbor Marina to Yellow Island in early May to paint wildflowers with friends as part of a 3-day watercolor class held on Orcas Island. We also snapped photos of the islands and sketched cherry blossoms in an orchard at Turtleback Farm Inn, a wonderful bed and breakfast in nearby Crow Valley. So much fun! 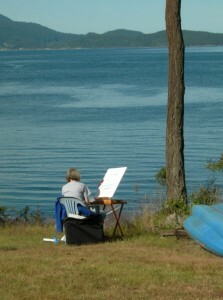 In Part 3, I’ll share about Alegria Island and other destinations within West Sound. Thank you for reading! 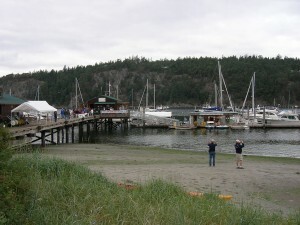 This entry was posted in Double Island, San Juan Islands and tagged Crane Island, Deb Garland's Scripture & Story, Deer Harbor, Deer Harbor Inn, Deer Harbor Marina, Double Island, Double Island - Exploring the Central San Juan Islands - Part 2, http://www.blog.debgarland.com, http://www.debgarland.com, Luke 12:27-28, Native Americans, Orcas Island, Pole Pass, Turtleback Farm Inn, Washington State Ferries, watercolor painting. Bookmark the permalink.